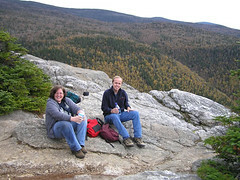 Last weekend (beginnig of October) I spend my entire Saturday, pulling my out of shape body up the moderate Imp Trail in the White Mountains. An old friend Bill was visiting an old friend of his, Scott, and they invited me to join them. 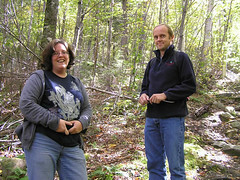 Here’s a pic (taken by Bill) of me and Scott on the trail. Have to say I almost gave up not even 1/2 way up the trail. But I stuck with it and both Bill and Scott were patience with me. They are in far better shape than myself. I was psyched to have completed the trail. And here we are up at the top. I really need to get myself more fit. Overall it was a really great day.Â The weather was fantastic and the trail not too crowded.Â I guess I need to find myself a club to hike with.